Connect, network and create. Join artists and community members at the Northern New Jersey Community Foundation’s (NNJCF) ArtsBergen initiative’s quarterly Connect the Dots. The Connect the Dots’ The Path of Us: A Public Art Fence Weaving: Session 2 takes place Thursday, April 11. Stop by from 6:00 p.m. to 8:00 p.m. The event is free and open to the public. Create and network at the Northern NJ Community Foundation’s Connect the Dots. Meet and network with artists, community members, business owners, and municipal leaders at Bergen Makerspace in the Bergen County Technical Schools Adult & Continuing Education Building. The Bergen Makerspace is located at 190 Hackensack Avenue in Hackensack, New Jersey. Furthermore, participants do not need to have attended the first workshop. The Bergen Makerspace staff and expert “makers” will provide one-on-one instruction on 3D printing. They will also offer participants the opportunity to design and produce individual embellishments for a public art fence weaving. Local artists and creatives of all ages contribute their unique talents to the project. In addition, they learn a new technology applicable in their own work. Furthermore, public artist Katherine Daniels returns to Connect the Dots. She will assist and instruct participants interested in creating and adding an individual fence weaving to the design. On Saturday, May 4, workshop participants and the community come together to install the finished large-scale weaving on the fence. Join the fun and also see the 3-D produced embellishments applied to a chain link fence. Afterward, stay for the installation on a heavily trafficked fence pathway between Bogota and Hackensack, New Jersey near the Midtown Bridge. 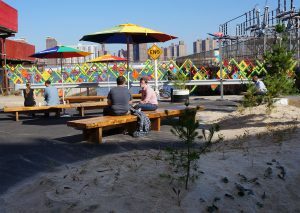 “The Path of Us, a community-driven public art project, seeks to transform the site through art and also meaningfully connect the community and the people who use the site. This workshop provides a great opportunity for artists and non-artists to network with others interested in beautifying our region through the arts, while learning new creative skills,” said Danielle De Laurentis, Associate Director, Northern New Jersey Community Foundation. The 3D printed embellishments will be applied to a chain link fence. The Path of Us: A Public Art Fence Weaving project is a collaborative effort. NNJCF partners with the Borough of Bogota and Bogota Beautiful to undertake this project. Notably, Bogota Beautiful, a community organization, commits to a high level of satisfaction and a great quality of life for the municipality’s residents. Furthermore, this is accomplished through beautification and improvement projects and community building events. The project has been made possible in part by a grant administered by the Bergen County Department of Parks, Division of Cultural and Historic Affairs from funds grants by the New Jersey State Council on the Arts. 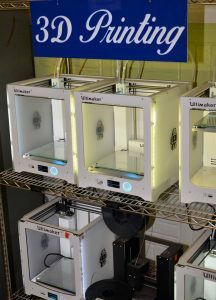 Bergen Makerspace is a community-learning center founded by Bergen County educators and operated by the Bergen County Technical Schools. Its three founding principles are: education, inspiration and community. The mission also serves as a catalyst for innovation within Bergen County. Furthermore, the organization brings together cutting edge equipment, passionate educators and a community dedicated to making. The Makerspace provides a physical space with practical instruction to empower artists, inventors, hobbyists and maker enthusiasts to achieve their goals. Space is limited. Pre-register online. For further information about the Northern New Jersey Community Foundation, contact nnjcf@nnjcf.org or call 201-568-5608. The Connect the Dots events are free and open to the public. Good-will donations are also welcome to defray the costs of the workshop series and the installation.